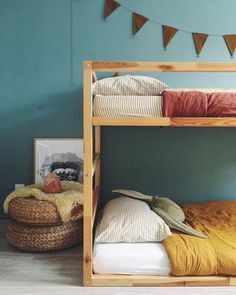 The biggest design dilemma we have when creating kids and even adult spaces is to add enough and stylish storage to a space. Good storage solutions can make or break a room design so I’m always on the hunt for fun and stylish ways to add storage to spaces. Today I’m sharing some of my go-to storage solutions that can be used in nurseries, kid rooms as well as the playroom. Teddy bears and soft toys seems to have babies in my house and I have recently done a major purge of unused soft toys, I still have loads that are still loved by me and the kids, but I do want them out of sight when they are not playing with them. The storage puffs from Migi Designs are the perfect storage solution and can be used as additional seating in the play room or lounge. It is also perfect for any not often used pillows, bedding or blankets. These storage bags from Simply Child fits into most spaces and can be moved around easily. They are super affordable so you can get a few for around the house. Clever Little Monkey stocks the Lorna Canals baskets here. Although pricey, they are a win because they are fully washable (just like the rugs) and also stylish enough to us in every room in the house. Hang up coats and bags with these cute wall hooks from Superbalist. One of my favourite wall accessories currently are the wall hooks by Mayalief, easy to hang and great for anything from clothing to toys to even towels. This is also not limited to kids spaces. 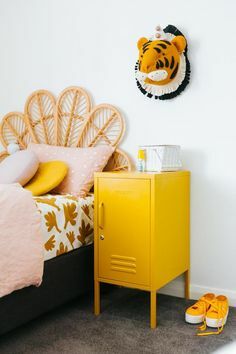 Quirky wall storage is my thing and I have been crushing over these curved shelving by Nest Design for ages. Scalloped shelving is always a winner for a more girly space and the ones from Dovetail are pretty AND functional. These industrial style wall shelves by Nest Design are also a winner in any room of the house. Book ledges are the best way in my opinion to store books to be easily accessible to kids. I have bought many book ledges and I have been disappointed by a lot. Some can be so shallow that you can only really use them to display a few books and nothing else, and you would actually have to have other storage for the rest of the books. I purchased my very first book ledge from Simply Child and they set quite the standard. They are perfect for displaying picture frames and books and even some small decor items. If you require a bit more book storage, then the book ledges from MRP Home is perfect. 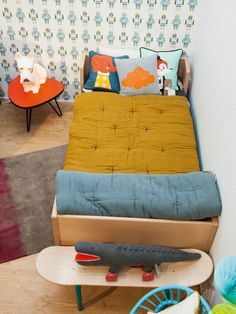 I do like the deeper shelve for the kids rooms. Another alternative book storage will be the book storage table by dovetail. Easy to reach for everyday use by the kids. The Flexa range from Clever Little Monkey has me swooning in the quality and design of ALL of their products. One of my favourite in the flexa range is the Play bench and storage box combo unit. It is practical and a brilliant design to avoid little fingers getting stuck when the drawers close. The Momster box is a local alternative to the above range, and is prices very reasonably. The boxes come int 3 different sizes and can be personalised… a definite win when you have kids sharing a room or would like to separate each child’s toys. In a recent playroom makeover I took the above storage shelve from MRP Home and turned it on its side to create a bench and added collapsible storage boxes in. It doubles as storage and seating in the playroom.